A new player has entered the game in Latin America. In 2016, China’s direct investment in the region had grown to about US$106 billion. On a recent mission to Latin America, Chinese President Xi Jinping demonstrated the size of China’s ambitions by promising to double trade to $500 billion, and increase investment to $250 billion by 2025. Interestingly, these investments are concentrated in just a few countries, and Ecuador is one of them. Together, Ecuador and Venezuela receive 28 per cent of China’s investment, and the two countries represent 65 per cent of all Chinese loans made on the continent in 2007-15. In late 2016, Ecuador was the first country Xi visited, en route to an APEC leaders meeting in Peru. During this official visit, he and Ecuador's then-president, Rafael Correa, signed 11 bilateral co-operation agreements, pledging investment in infrastructure, finance, agriculture and manufacturing. Perceptions in Ecuador are mixed about this largesse. Critics worry about Beijing's motives, and about the sustainability of projects receiving Chinese investment. 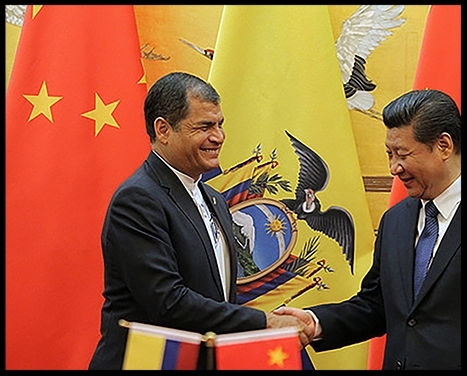 They point to Ecuador’s huge and growing debt to China. Since 2010, the country has received $15.2 billion in loans from Chinese state-owned banks. And, by tying the loans directly to oil, China has positioned itself as the dominant creditor, while securing a long-term petroleum supply. As Universidad San Francisco de Quito political science professor Maria Dagg says: “Ecuador has made a bunch of deals with China where they’ve presold a lot of our oil reserves to China until 2020. “The premise is that China does not have oil. We have oil. We sell you oil, China. And you build different projects for us. Major infrastructure projects. Roads. Dams. Which sounds good on paper. One impact of this oil-for-debt relationship is that, to service its debt in times of decreasing oil prices, Ecuador must produce more oil. And, often, Chinese firms are doing the oil extraction. Consortiums of Chinese firms drill in places like Yasuni National Park, which companies from other countries avoid, intimidated by the environmental issues and indigenous opposition. Concerns are growing about the China-Latin America ties. For example, a major study by a co-operative of universities found that Chinese trade in Latin America has driven environmental degradation and social conflict. Also, the U.S. think tank, the Brookings Institution, has issued a report arguing that Chinese investment is concentrated in countries with poor governance, which helps maintain autocratic regimes. Correa tied Ecuador’s prosperity to this relationship. By castigating Western companies as imperialistic and unfair to Ecuador, he helped drive them out of the country. Yet, his administration adopted a markedly different tone to Chinese investment.